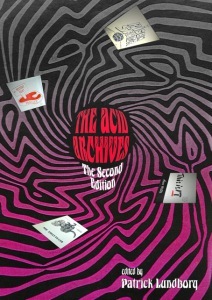 The print version of ACID ARCHIVES – The Second Edition is now available exclusively via Kindle/Amazon. Click the link to be forwarded to Amazon’s book store HERE to order. Click the link to be forwarded to Amazon web-store. Bigger, better and more colourful! After the huge success of the first edition from 2006, the Acid Archives book has been long out of print. Used copies have sold as high as $200, and there are many inquiries about new runs from around the world. Instead of just a new printing, here is a brand new Edition – completely revised, massively expanded, and attractively re-designed. The Acid Archives Second Edition will delight any lover of rare and great underground music from the 1960s-70s. All the elements that made the first edition such a hit are here. The A-Z section has been expanded with 90 new pages, detailing many hundreds of previously unknown LPs. Just as exciting is a brand new section of Special Features, where leading experts present the best and rarest albums within Exotica, Lounge, ‘70s Funk & Soul, Southern Rock, New Age, Custom Labels and Tax Scam Records. In answer to requests from fans of the first book, the Acid Archives has been fully re-designed and is now printed entirely in colour. The 400 pages in the Second Edition (100 pages more than the old version) are loaded with colour images of obscure and trippy album sleeves, posters and band photos, many of which have never been published before. The largest selection ever presented of underground albums from North America 1965-1982. Original release data and in-depth commentary from world-leading rare record experts. Ratings of LP market value, detailed reissue data, and full colour images of rare and trippy albums sleeves. Special feature essays about rare Exotica, Lounge, ‘70s Funk & Soul, Southern Rock and New Age albums, written by leading field collectors. A brand new round of informative and hilarious Top 10 Lists that were a popular part in the first book. 400 pages printed in full colour throughout.